The Billion Oyster Pavilion An installation on Governor’s Island for Summer 2015, that will become a Permanent Contribution to NY Harbour as Oyster Reef. FIGMENT’s City of Dreams and The New York Harbour School’s Billion Oyster Project to create an immersive art space that will ultimately help restore New York City’s waterways. The City of Dreams Competition is organized by the American Institute of Architects New York Chapter Emerging New York Architects Committee (ENYA), the Structural Engineers Association of New York (SEAoNY) and FIGMENT NY, a non-profit arts organization. 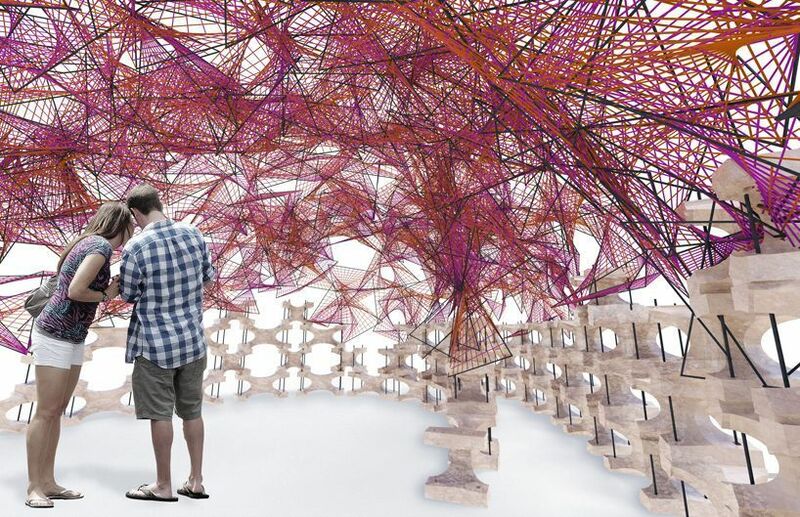 The competition brief asked architects and designers to propose a pavilion with the theme “the city of dreams” that would employ recycled or recyclable materials. Out of hundreds of entries, BanGs Billion Oyster Pavilion was chosen as a winner. Did you know that in 1609 New York Harbor held 220,000 acres of oyster reef? Now, in 2015, conditions have finally improved to a point where we can reintroduce oysters to the harbour, greatly improving the water quality, protecting the city from storm surge flooding, and eventually providing $1 NY oysters galore! The Billion Oyster Pavilion is a temporary pavilion that will make a permanent contribution to New York. All of the materials used to construct the project will be re-used by the Harbour School to re-build oyster habitat in New York’s waterways. The Billion Oyster Pavilion will be turned into two different kinds of housing for oysters at the end of the season. The cast concrete elements at the base of the pavilion are actually BanG’s custom designed “Reef Balls.” The woven canopy will be turned into “Oyster Condos”- metal cages that are filled with old oyster shells. Both the Reef Balls and Oyster Condos will be covered in oyster spat and placed into the harbor to anchor new oyster reefs. As a focal point of the arts festival, the Billion Oyster Pavilion will make the important work being done by the Harbor School visible and tangible for hundreds of thousands of visitors. FIGMENT is a not-for profit arts organization, and all of their money comes from donations and fundraising efforts. The Billion Oyster Project (also not-for-profit) will benefit greatly from all of the donated material and publicity this project will generate. We are passionate about this project and the restoration of our harbor. We hope that you can support it too!